The Honda XR650L is a fine motorcycle but, like all motorcycles, has some known weak points that should be addressed in order for owners to enjoy maximum life and performance from the XRL. One problem in particular with the Big Red Honda is premature countershaft wear. Many owners have reported having to replace the countershaft at much lower mileages than is typically expected. It is not uncommon for the XR650L countershaft to be worn out and in need of replacement at less than 30,000 miles (mine needed replacement at 23,000 miles). The problem with replacing the countershaft is that it is difficult, time consuming, and expensive. In researching the cause of the problem, owners determined that the design of the front sprocket was one important factor contributing to the accelerated wear. For whatever reason(s), the contact area of the XR650L front sprocket is not as wide as it could be. Additionally, the front sprocket is harder than the countershaft (or the countershaft is not as hard as it should/could be). The end result of a narrow, hard front sprocket is excessive wear and a shortened life on the countershaft. As a work around, XRL owners often resort to using the front sprocket from a Honda XR650R. The XRR sprocket fits the XRL and is a full spline contact sprocket, which minimizes countershaft wear. After I paid to have my countershaft replaced, I too decided that using XRR front sprockets was the way to go. You can see the XRR sprocket on my bike in the picture above. Using the XR6550R sprocket is not without problems though. In fact, it creates two additional, but less severe and costly, issues. First, the XRR sprocket causes chain misalignment resulting in accelerated chain and sprocket wear, and second, the XRR sprocket is not reversible, meaning you can only get half life from the front sprocket (you increase sprocket life by reversing the sprocket from time to time). 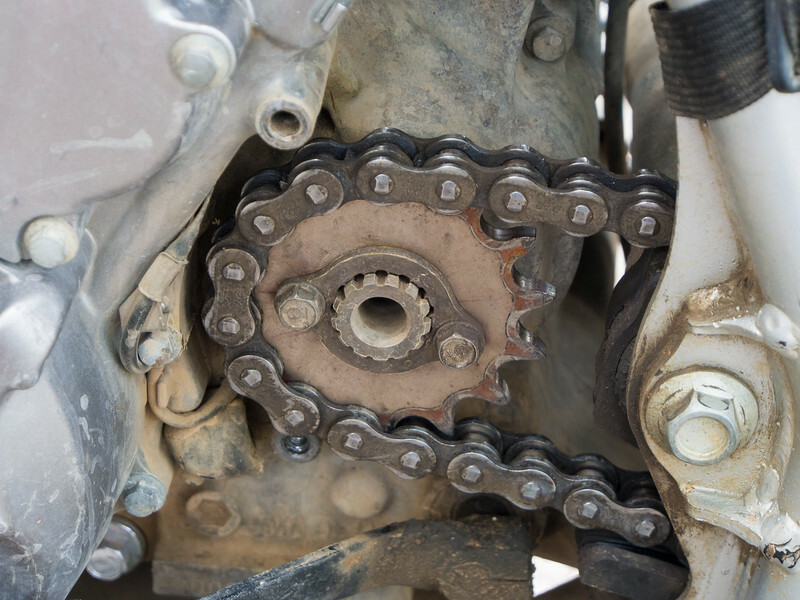 While good chains and sprockets aren’t particularly cheap, they are considerably less expensive and easier to replace than a countershaft so XRL owners typically opt to run the XRR front sprocket. 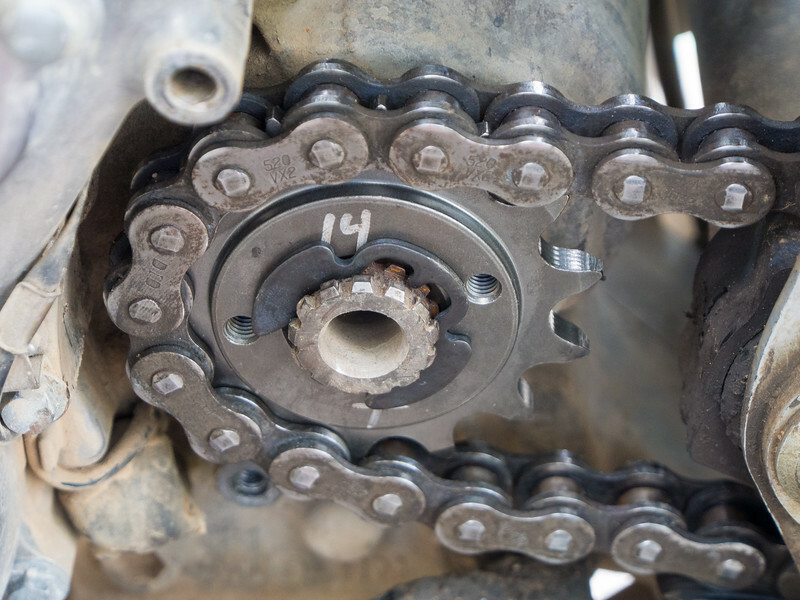 Chain misalignment and accelerated chain and sprocket wear are preferable issues to replacing the countershaft more frequently. Luckily, there are some in the XR650L community that have devised fixes for the Big Honda’s shortcomings. One such upgrade was created by an XR650L owner named Fritz Huss. He developed an elegant solution for the countershaft / front sprocket issue by manufacturing a full spline contact, correctly spaced front sprocket that he calls the FRITZCOINC sprocket. Fritz sent me a 14 tooth FRITZCOINC sprocket for use on my XRL. Though I had heard about his sprockets, I had never seen or had any experience with one and was eager to check it out. In the photo below, the XR650R sprocket that I was using on my XRL is on the left and the FRITZCOINC sprocket is on the right. As you can see, the teeth on the XRR sprocket are not centered, which causes a misalignment of the chain and prevents the sprocket from being used in both directions. Conversely, with the FRITZCOINC sprocket, the teeth are centered – meaning the chain runs true and the sprocket is reversible, extending the sprocket life. As I said, it is an elegant solution. Why Honda’s engineers did not originally design the front sprocket like this is beyond me, but luckily the XRL community has guys like Fritz taking the initiative to fix known issues. So, Fritz’s sprocket with full spline contact minimizes countershaft wear without causing chain misalignment and it comes with the added bonus of being reversible. In my opinion, this is a big win in anybody’s book. However, not content to stop there, Fritz also includes a quick change retainer clip to replace the OEM two-bolt system. This allows the owner to swap sprockets quickly and easily in the field, a real advantage when a rider wants to use a larger front sprocket to ride pavement to a riding area and then swap to a smaller front sprocket upon reaching the trail head. 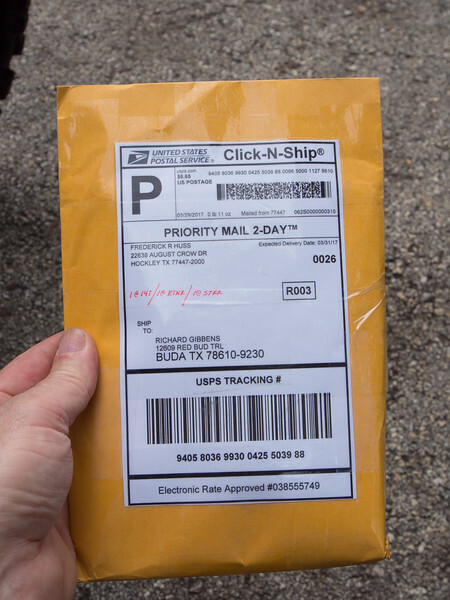 I opted to install the FRITZCOINC sprocket using the quick clip, as you can see in the photo below. Note that you are not required to use the quick change clip – the FRITZCOINC sprocket is drilled so you can use the stock two bolt mounting plate. It’s your choice as to which method you want to secure the sprocket with. If you expect to swap front sprockets regularly, then I think the quick change clip is the way to go. Finally, Fritz reports that his sprockets are manufactured using alloy steel and then heat treated – a process that makes them the equal of OEM sprockets in terms of quality and life expectancy. 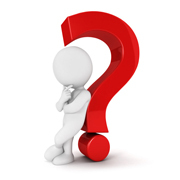 What if your countershaft is already exhibiting signs of wear? Can you still run the FRITZCOINC sprocket and will it help? 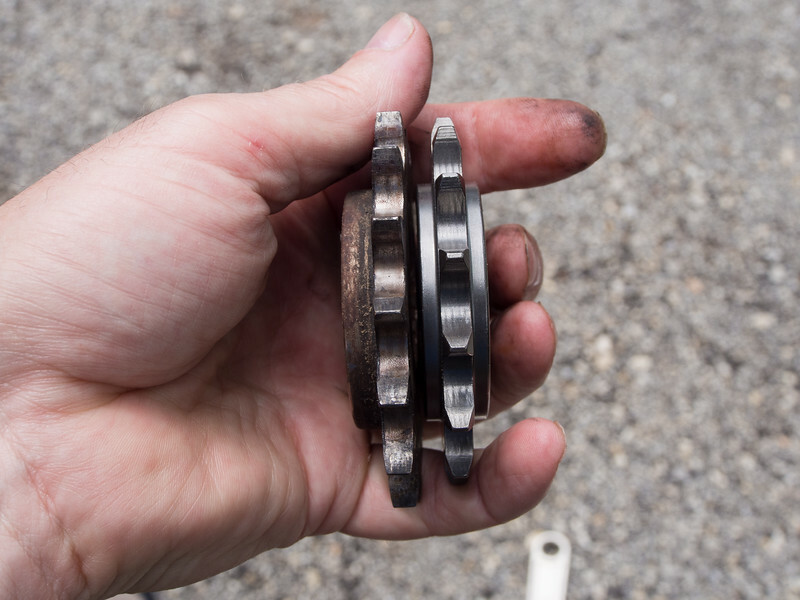 Yes, you can still run the sprocket and it may actually extend the life of your countershaft. Fritz’s sprocket is wide enough to bridge the wear area made by the OEM sprocket, spreading the load over a wider area. Lastly, Fritz also suggests that lubricating the spline is still required even when using his sprocket. Lubing the spline is one of the things the XRL community recommends to extend the life of the countershaft for those using the OEM sprocket or the XR650R sprocket. Using the FRITZCOINC sprocket doesn’t change that recommendation – you should still lube the splines. To do so you can use a lube such as Honda M77 Moly Paste. At the end of the day, this is one of the things that every XRL owner should get for his bike. Replacing the countershaft is not easy, quick, or cheap. (Changing countershafts requires that the lower part of the motor be split in half, known as splitting the cases, which is a task that is beyond the comfort levels of most owners.) Installing a sprocket that minimizes countershaft wear and doesn’t create additional problems is an excellent solution and something that all XRL owner can (or should be able to) do. Spending about $30 on a FRITZCOINC front sprocket to save somewhere around $500 (or more) on a countershaft replacement just makes good economic sense. Fritz has a write up about his sprockets on advrider.com and sells them on ebay. Go here to learn more and to order your own.